MIDDLEBURY, Ind. — The goal: design a motorhome that is ideal for relaxing and entertaining. The team: Sportscoach engineers and designers. The result: the new Pathfinder® 405QS. What they created is an innovative floorplan that puts the galley in the front of the coach, creating a more open and generous central living area. The galley and living area are enhanced with dual slideouts that optimize space. The end product is a living area that is appealing and comfortable. Residential-style furniture makes the living area more like home. The plush sleeper sofa, the comfort lounge/sleeper, the decorator accents and the ceramic tile flooring from entry way to the bath area all add to the charm of this coach. Crowning the living area is a 32-inch LCD television with a DVD/CD player combo in the entertainment center. Another elegant touch is the 6,500 BTU electric fireplace at the bottom of the entertainment center. The galley is perfect for fixing a tray of snacks or an elegant, four-star dinner. The large, double door refrigerator features glossy black insert panels and an optional icemaker, making it as attractive as it is functional. The three-burner range with oven and an optional convection microwave oven make meal preparation easy. And, the raised panel cabinet doors provide access to a huge amount of interior storage. The luxurious bath has a rain glass textured shower door, skylight over the shower, premium faucets and high-quality porcelain toilet. Dual slides ensure the bedroom is spacious and comfortable, and Pathfinder continues to sport the true flat floor in the bedroom. The queen bed is designed for comfort, whether sleeping or watching the 20-inch LCD television. The cedar-lined wardrobe ensures clothing stays fresh. Anyone who sees Pathfinder cruising the highway or parked at the campground will know this coach is special. Sportscoach designers created eight different exterior paint options, three of which are motorsport based. Each gives the motorhome a distinct standout personality. Sportscoach engineers designed the front end to give it a bold, aggressive look, and the one-piece windshield gives the driver an unobstructed view of the road. The engineers ensured the motorhome was as functional as it was good looking. Handy insulated aluminum side-swing storage doors access extensive pass-through exterior storage. Fuel fills are located on both sides of the coach, eliminating the need to maneuver around a filling station's lot. Under all those good looks lies raw power. Pathfinder incorporates the ISB 340 horsepower Cummins engine into its Freightliner® chassis. This 6.7-liter diesel engine coupled with the Allison™ 2500 MH 6-speed, automatic transmission delivers 660 lb.-ft. of torque. Merge onto the interstate and cruise with confidence. Pathfinder 405QS joins the other two Pathfinder floorplans, the 384TS and the 386QS, to give those who want the ultimate in a diesel coach plenty of options. 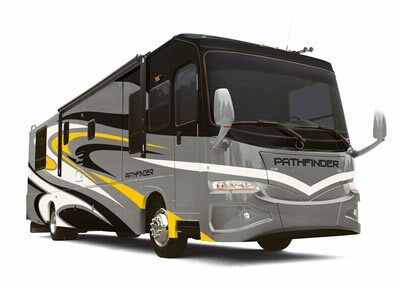 The manufacturer's suggested retail price on Pathfinder 405QS begins at $199,500. To learn more about the Sportscoach Pathfinder, visit the website.